We have already known that bright light therapy can be an effective cure for seasonal depression, but a new study from Finnish University students has revealed that it also benefits those not struggling from seasonal depression at all. When the therapy is administered through the ear canal directly to the photosensitive brain tissue, it not only improves the cognitive performance and mood of those with the depression, but those without it as well. According to the study, which was published at the Scandinavian Physiological Society’s science conference in Helsinki, bright light administered through the ear canal improved the cognitive speed of students. Administering the Valkee bright light through the ear canal increased the motoric reaction speed of National League professional ice hockey players, compared to a placebo group, results showed in a different study earlier in the year. Both studies further support findings published in May that revealed that trans-cranial bright light clearly increases functional activity in specific regions of the brain. The current study was conducted with 41 students (average age of 24) at the Technology School of the Aalto University in Espoo, Finland. Half of the students received a daily 12 minute bright light treatment through the ear canal for 3 weeks. Experts observed how long it took participants to correctly recognize quickly flashing computer-generated random characters on a computer screen. The subjects that received trans-cranial bright light treatment improved their reaction time by 25-30%, compared to performance before the treatment and compared to a control group. In the earlier research with hockey players, the reaction time of the test group to a visual stimulus also improved by 25-30%, said Professor, Leading Senior Physician Timo Takala from Oulu Deaconess Institute. These results are important because they show that the reaction time of healthy people can be improved by bright light administered with a headset through the ear canal. Both studies support evidence from the Finnish study in May, that shows how bright light significantly increases activity of the neural networks, especially in regions of the brain linked to visual perception, when channelled directly to the brain. 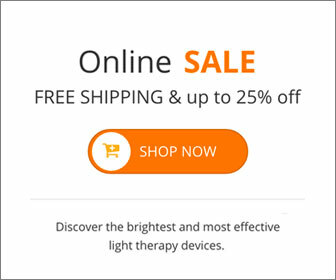 There has been much research on the Valkee bright light headset for seasonal depression (S.A.D.). The headset is based on light treatment directed to the brain by auditory canals. The depressed brain reacts to light, because the brain has large amounts of photosensitive OPN4-protein, also known as melanopsin. Light penetrates the brain tissue and the melanopsin through the ear canal and through the thin bone and tissue structures. This entry was posted on Wednesday, September 12th, 2012 at 9:14 am	and is filed under SAD. You can follow any responses to this entry through the RSS 2.0 feed.